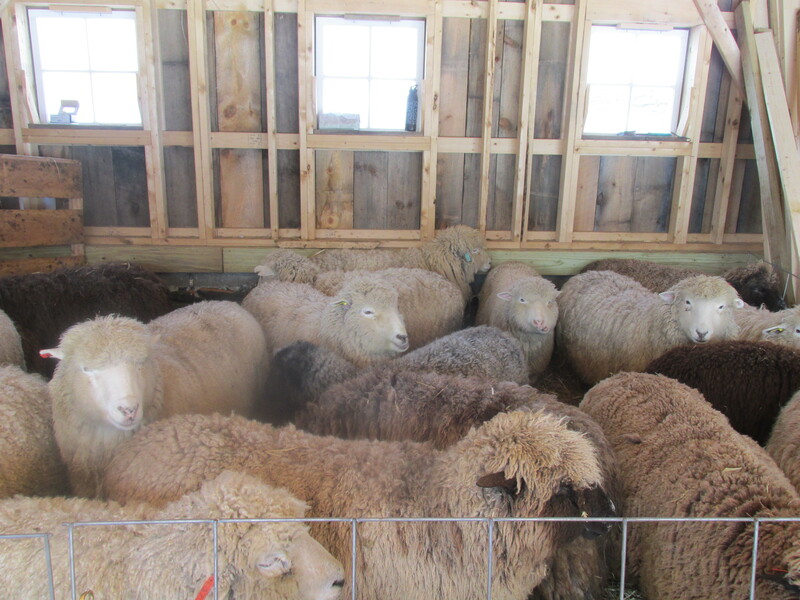 Rain and warmer weather have started the flow of water into the barn. I am heartsick about it. Hope we get a few more days of cold weather . On Monday night I started coming down with it and although i am a little better but far from being back to normal. Now I am a month behind in choresonly doing what is necessary feeding and cleaning up after the animals. I wasn’t taking the immune boosters like I should but will from now on. It will take me quite a while to recover from this and the torn muscle. I had a wonderful bright spot in my day today. 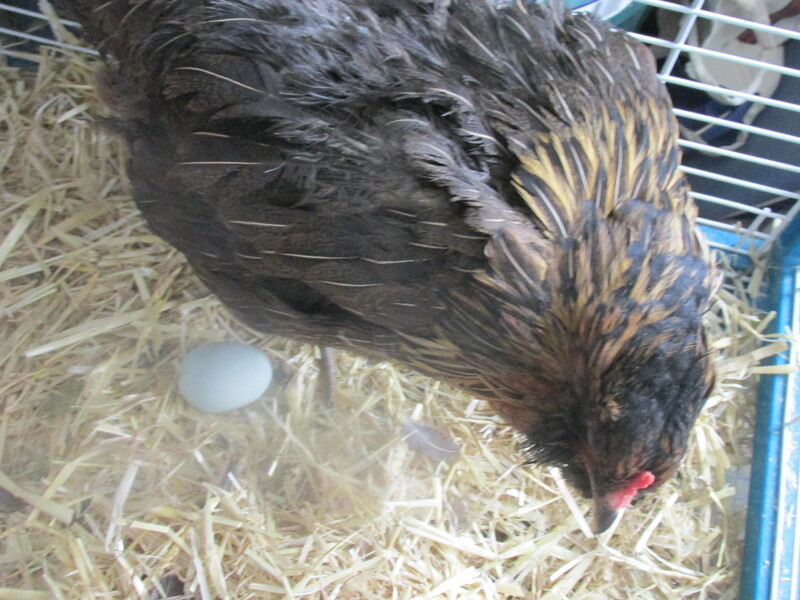 Helen laided her second egg. 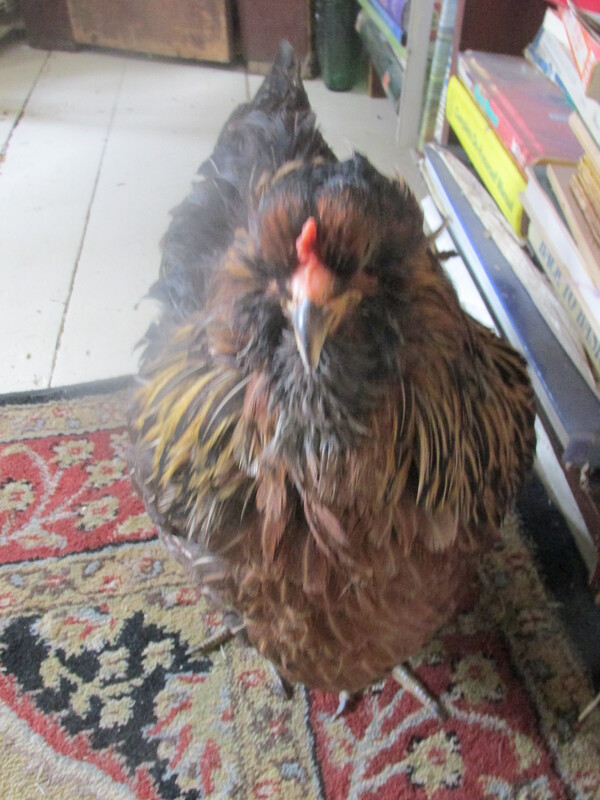 She has recovered enough to continue with the egg laying process. She was so proud of it showing it to me. I think she will always have to be watched over. Many thanks for reading my blog today and I hope you have a wonderful day. To all the families of Flight 9525 myprayers and heartfelt sorrow are with you. We have had light snow off and on all night and it’s still snowing this morning. 3-4 inches are on the ground. 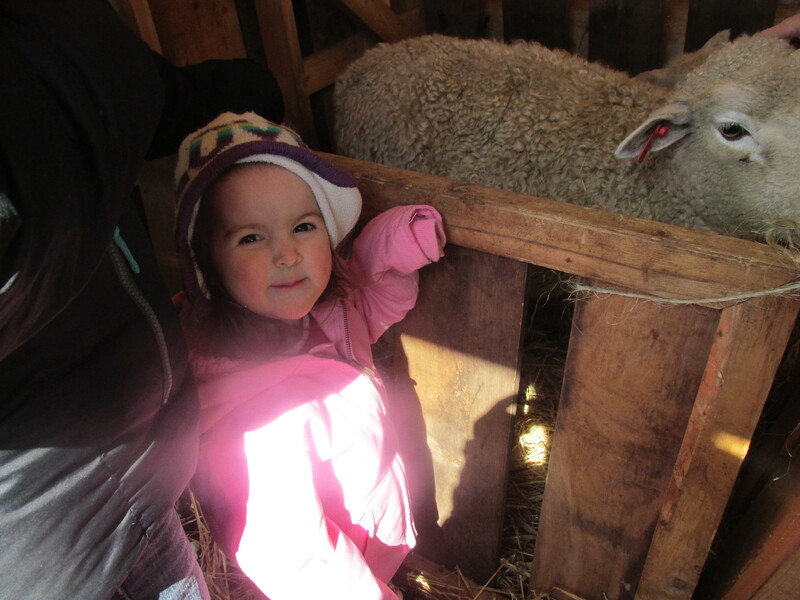 I hope this is the last of it as we were having a great slow thaw. 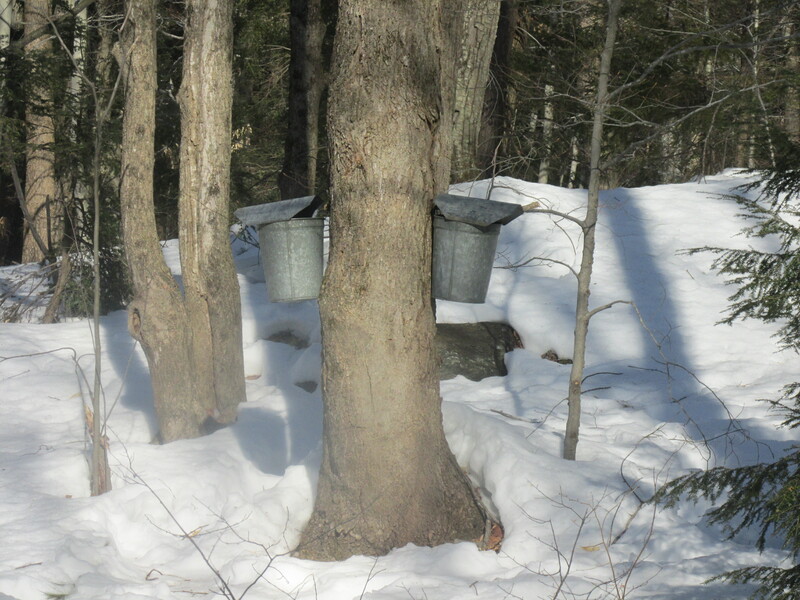 The sap buckets are in place along my favorite back road but the sap is not running with this cold weather. Warmer days are expected for this coming week and it will be moving again. 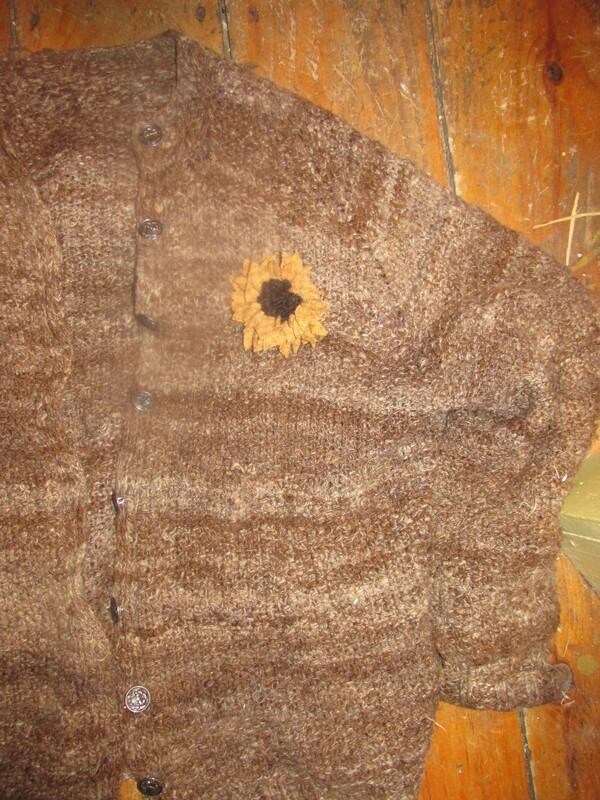 The Sunflower Pins are at SHeep and Shawl. Learn to make then, its only an afternoon class. They are easy to make . And so many uses. They could be glued to a head band,and in art pieces and many other things. Sheep and Shawl has add many new things come on down and check it out. 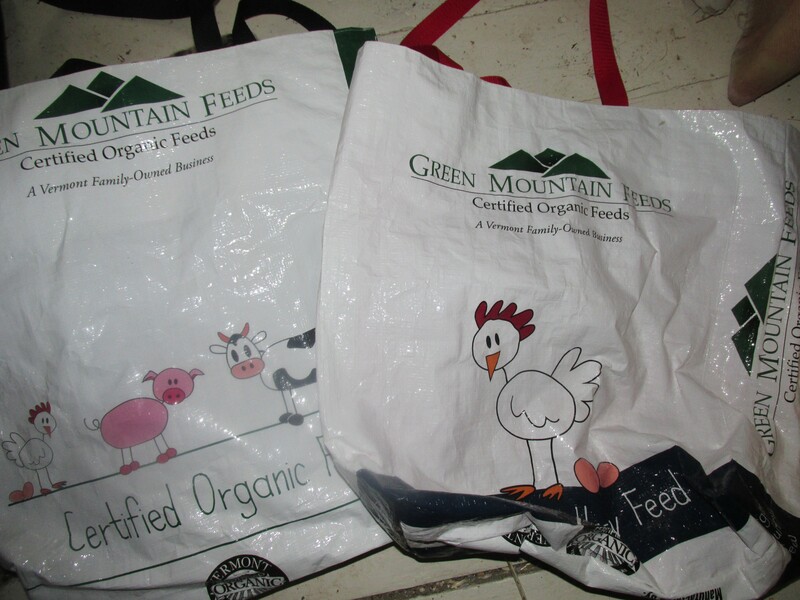 She is now selling my neighbor Christa’s hand-made grain bags too. 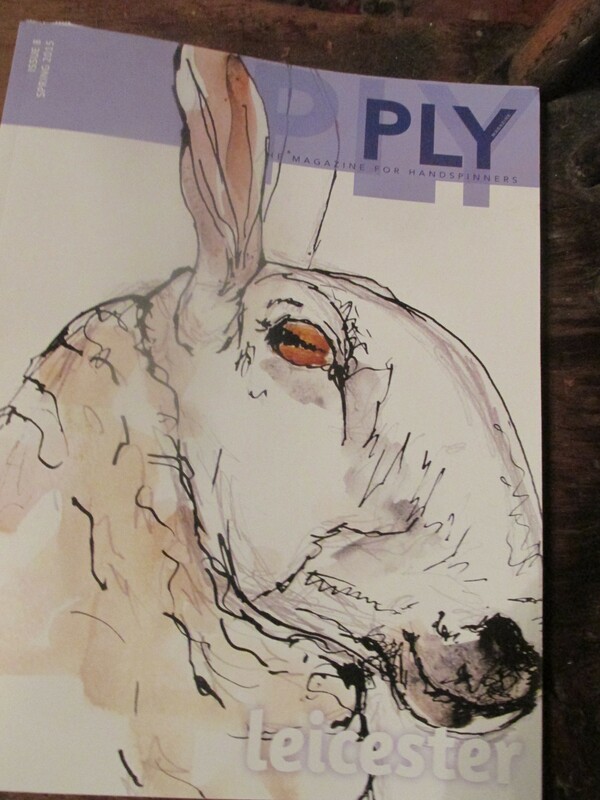 The new PLY magazine is in and it full of interesting facts about Leicester SHeep. 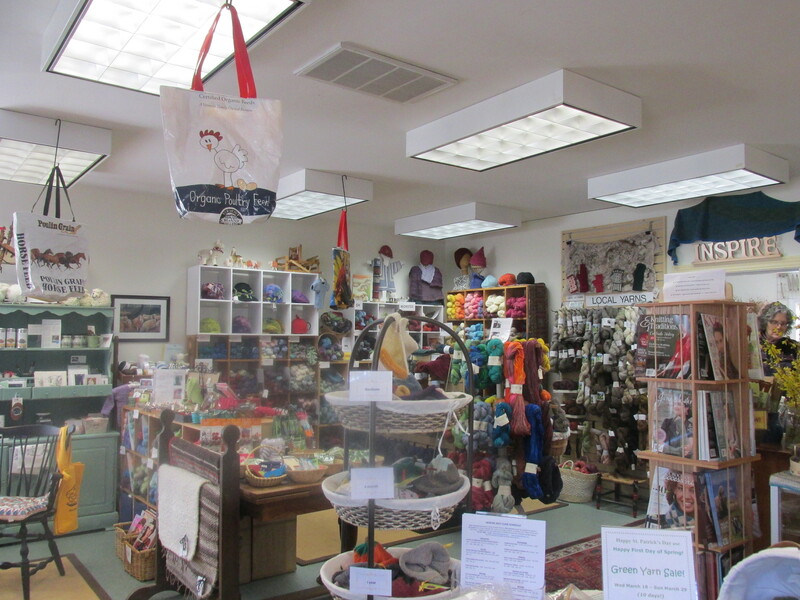 Sheep and Shawl has something for everyone, stop by soon. 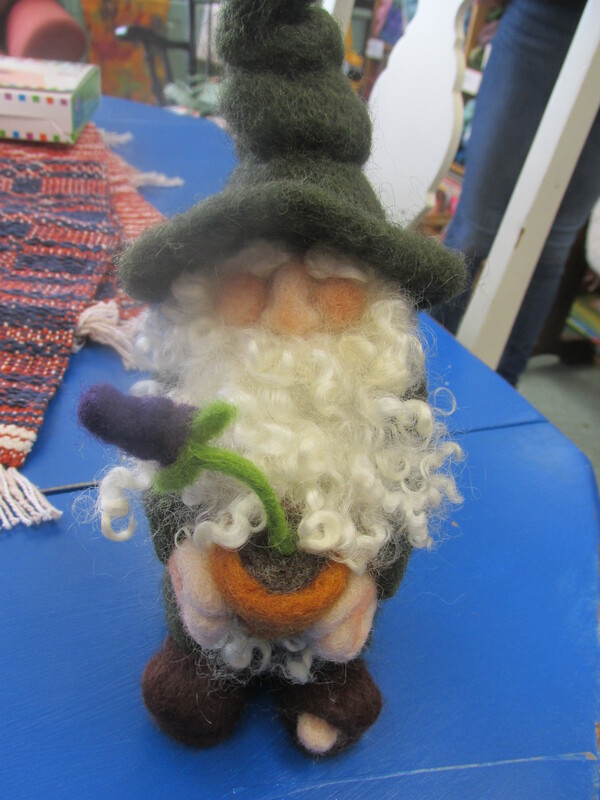 She is having another needle felted workshop soon. This is the next project and I am taking it. At Thursday Spinners I mentioned I needed to get going on Soap making. A friend Sandy said she tried it once and had some supplies that she wanted to give away. 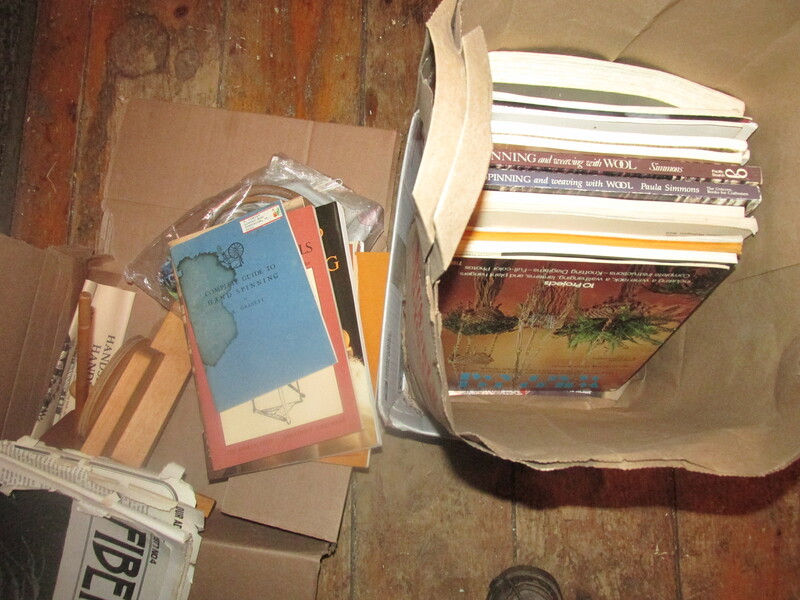 Yesterday I went over to pick up some Coconut Oil and she had added another box of wonderful things to that. 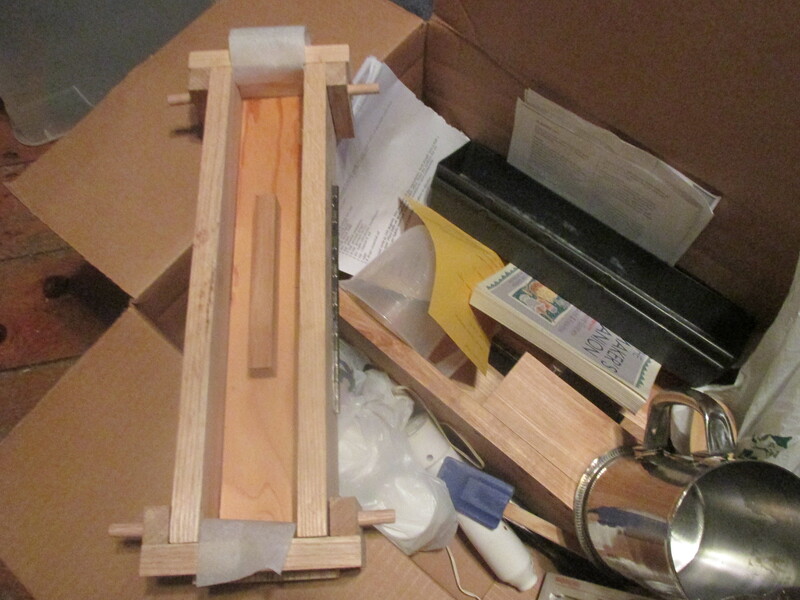 2 wonderful soap molds hand created by her husband who is a wonderful wood worker and a cutting board. These will make my soap making days so much easier. Molds are very important in soap making and I have bought many of them and yet to find one that is easy to use. I am sure these are the ones I have been looking for. I am so grateful for these treasures. I will get to the soap making next week. I went to physical therapy yesterday and its a strained muscle. It’s already getting better and a few exercises will strengthen it. SHe was surprised at how strong my upper body was. Carrying all those grain bags is helping me stay strong. Jill and Jim need some help so I will be there today. 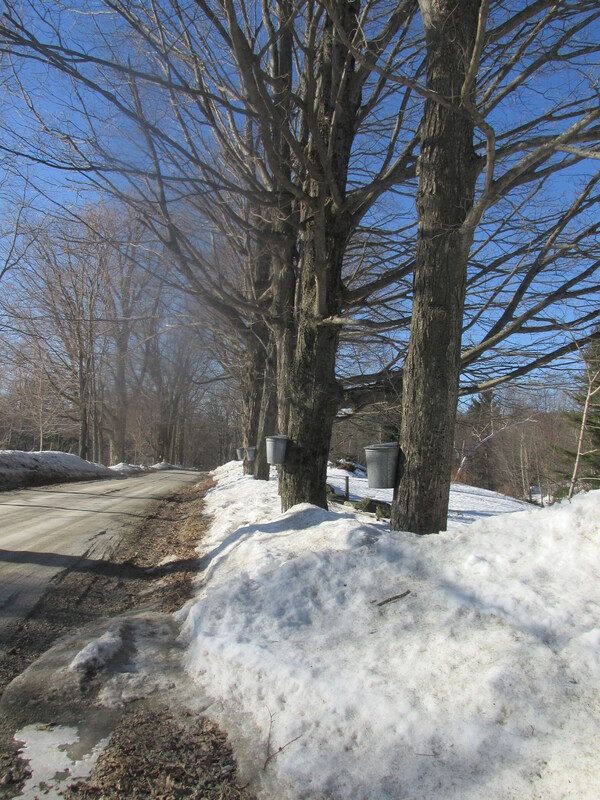 With the snow I think the turn out will be sparse, too bad because it’s always fun to watch and educational too. Hope to see you there. I will be rug hooking. The March winds have been howling for many hours now. 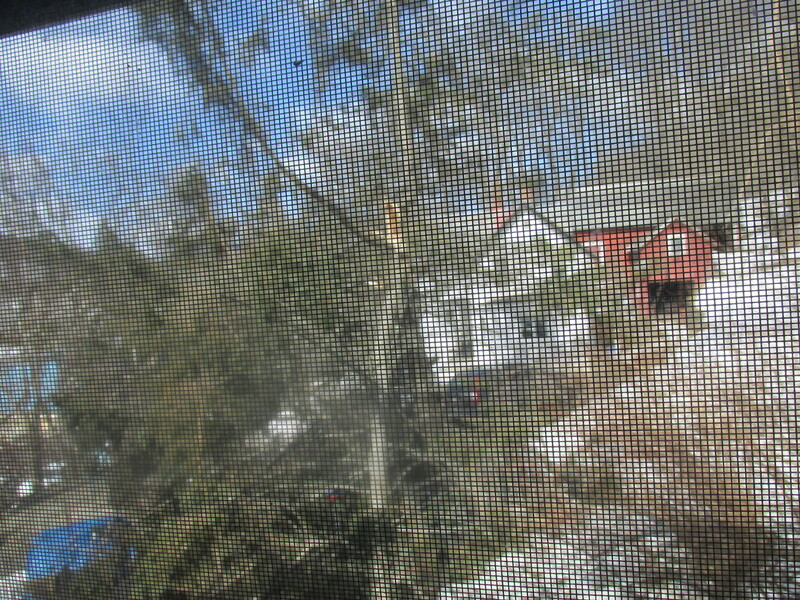 And this morning the top of my favorite tree came tumbling down. 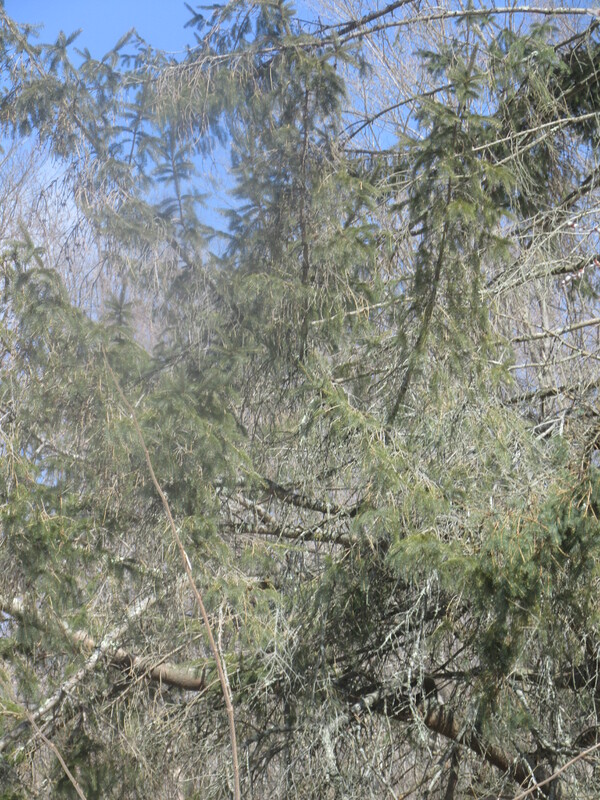 The tree was not in good shape but was a gathering and nesting place for many birds. 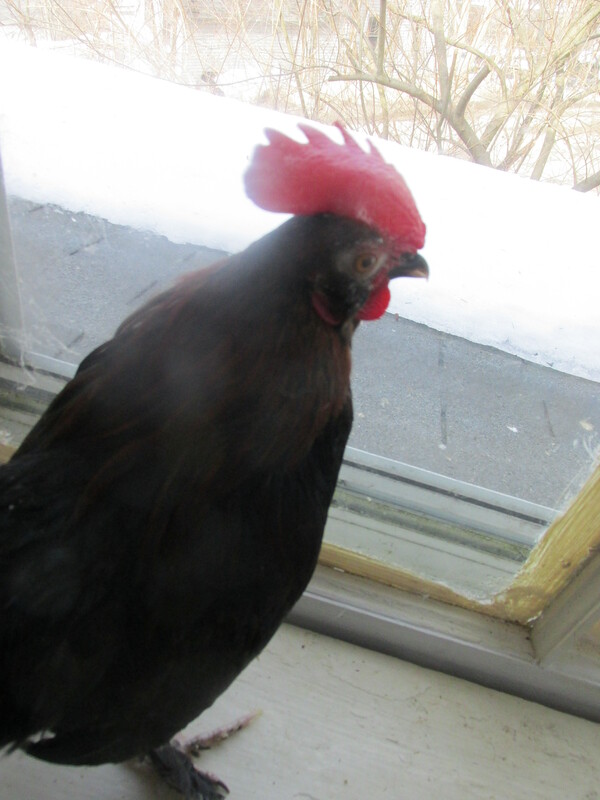 It sheltered my chickens from hot summer days, and gave me enormous amounts of smallish pinecones. It will all have to come down It saddens me and I will miss it. 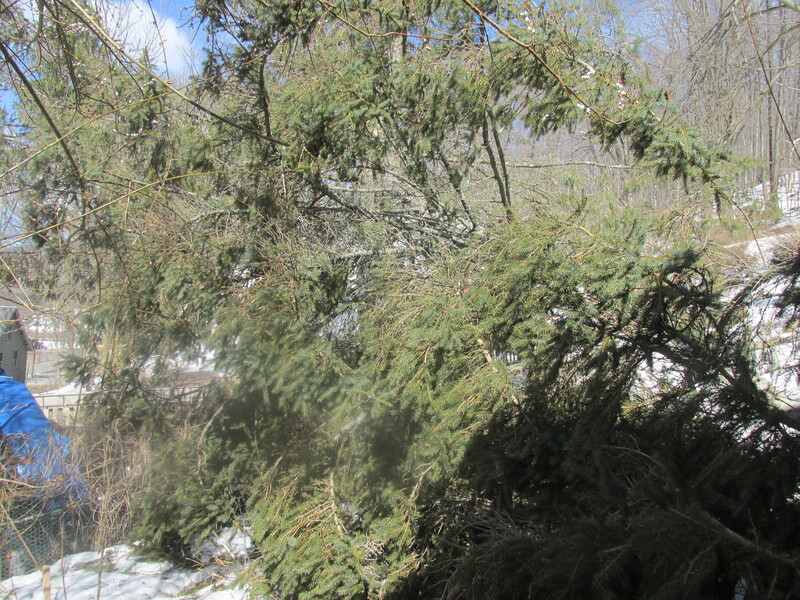 I will plant some hemlocks closeby in the spring. Trees give us so much, its hard to believe how much they mean to us till they are gone. I don’t know if my poor apple tree survived the fall and will only know when the tree is cut up. Hope so as it took a beating from the people who did the cement work on the house and has come back with tender loving care. The day started off dark, damp, and dreary but there is sun and clouds now and the temps are nice Snow is slowly leaving the mountain and the chipmunks and skunks are back. 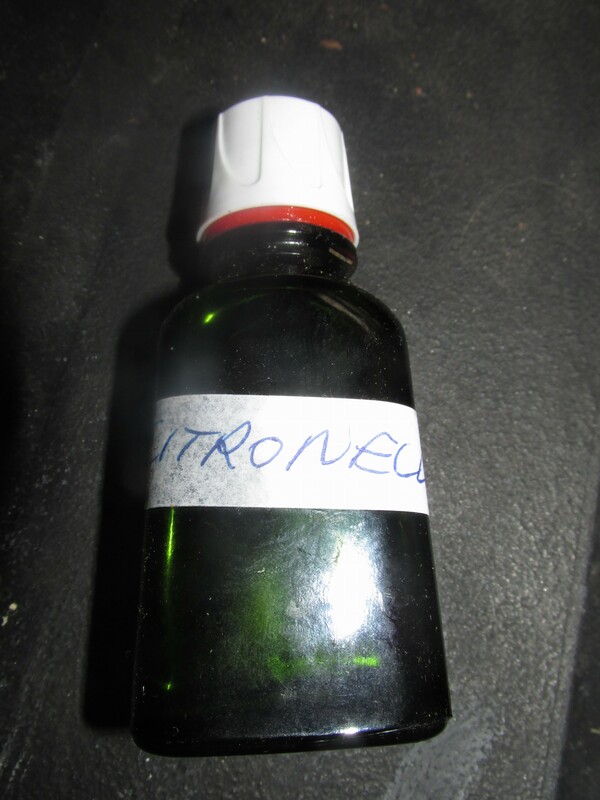 And a bottle of citronella oil that she had made herself. I have been thinking of them this morning. What a nice surprise. 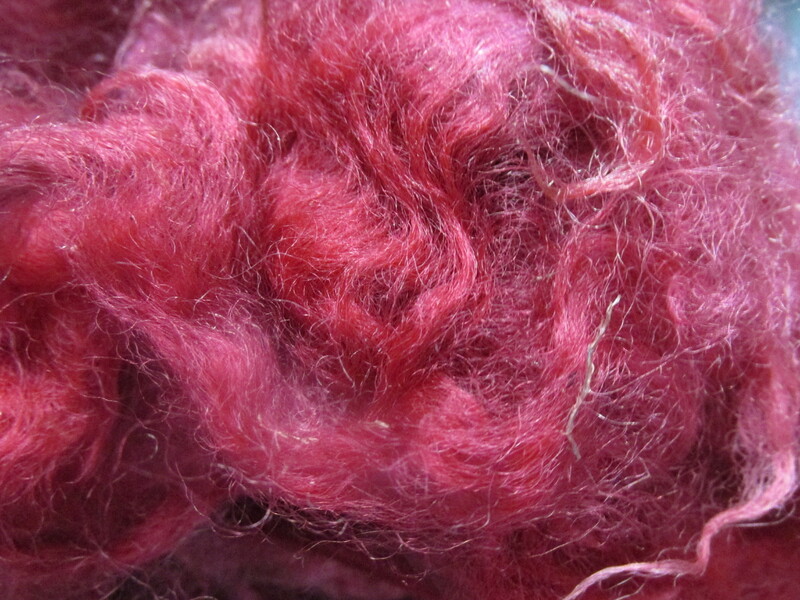 Then Wool and Dye works called to place an order for dyed wool, I had been thinking of those wonderful folks lately and planning a trip down. All this in one morning.What a day. My dream was to have a herb farm, grow herbs and flowers have a small shop on the property with an occasional open house. Things didn’t quite go that way. This dream has been on the back burner since the mid seventies. I have decided to pursue it now in a very small way. The dream all started when I would demonstrate spinning at The Big E. I would wander around and always end up in Storrowtown village in the Caprilands booth. I loved everything in the booth. All the herbs and spices wreaths and other things. I can still remember the smells. I started adding herbs and flowers to my gardens, reading and researching. Now there are so many people doing this that I have to find a niche. 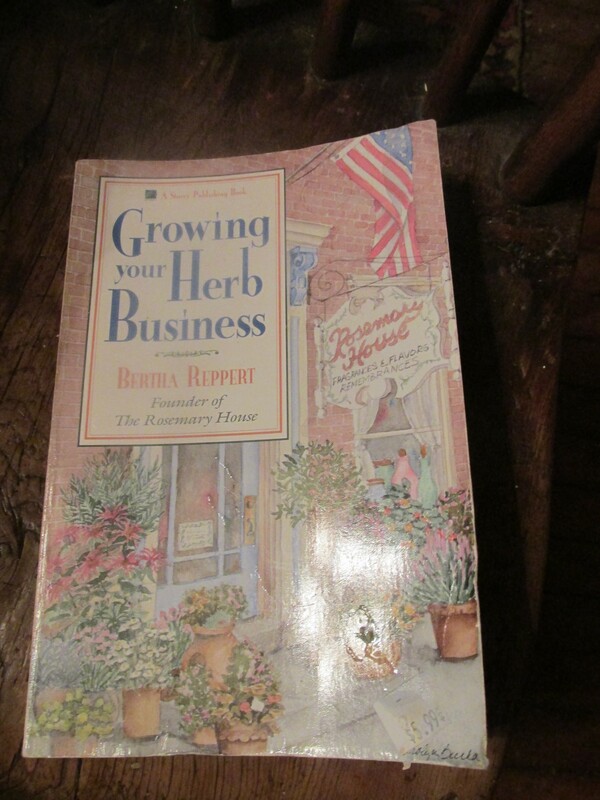 I came across this book, Growing your Herb Business which I had bought a long time ago. I am reading it and making notes. It has a lot of very good information. I do make a lot of herbal things and have decided to grow herbs that aren’t as popular. 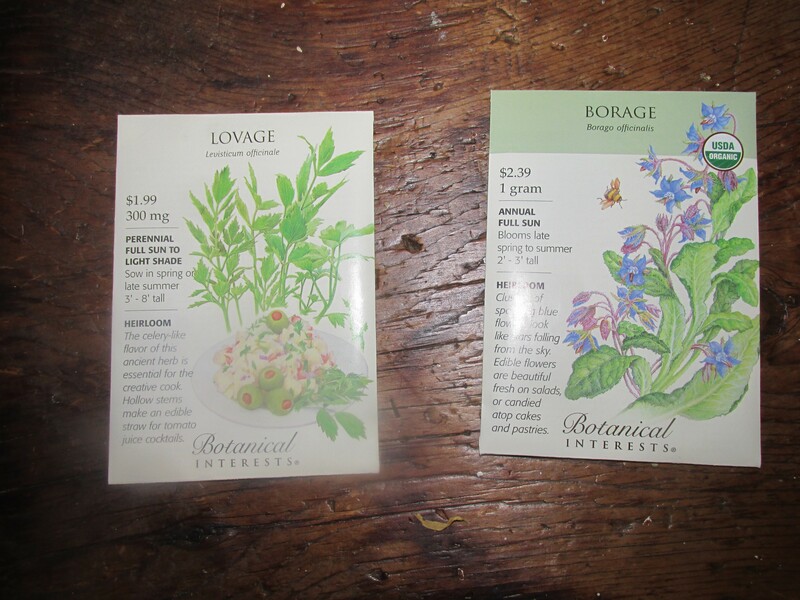 Borage and Lovage are two that come to mind and I hope to start soon.. 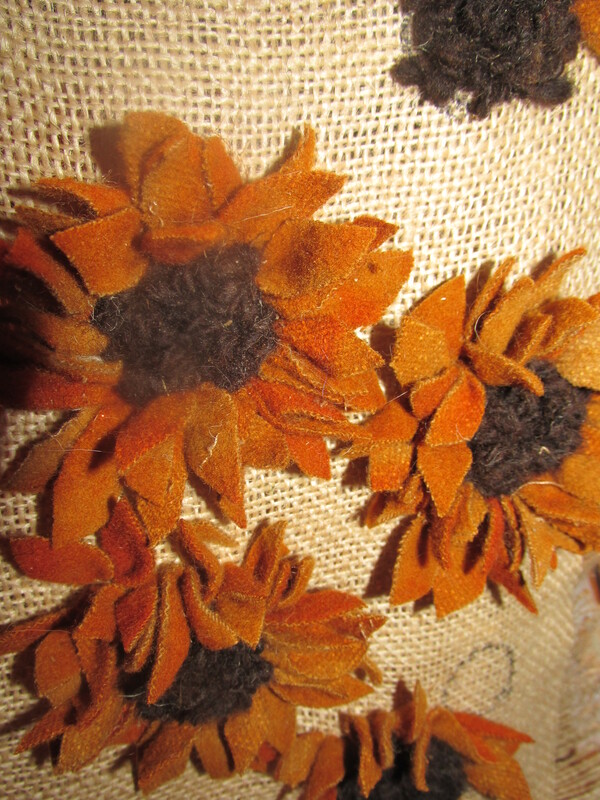 I have started Sunflower Pins, Some will go to Sheep and SHawl for sale. They are fun and quick and I will be having a class in making them there at the end of the month. 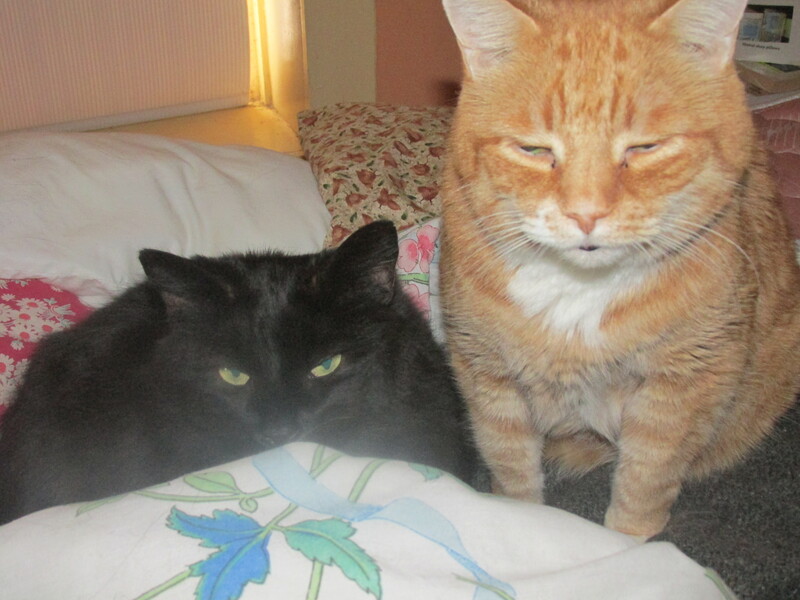 My cat friends are napping upstairs today where it is nice and warm. I wonder if they will be doing more yarn bombing tonight!!!! Well so far so good the water trickling into the barn in minimal. We will be having warm and cold days ahead with winds on Wednesday which will help get rid of some snow.. I can now see the rocks in my sons yard and some leaves too. On Sunday while cleaning out the barn I hurt my shoulder. 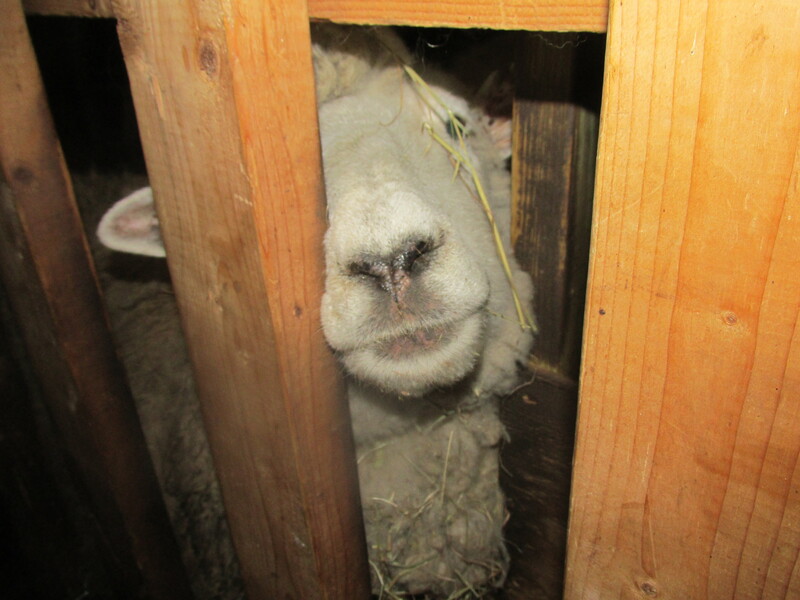 I was lifting up a pitch fork full of barn sweepings and heard a crinkling sound and then came the pain. I decided not to go to the ER. I could move my arm and still function. Nevertheless nothing more got accomplished that day. I have called the doctor and cannot be seen till Wednesday They think it might be a muscle tear. Sam has come into his own here at the farm. 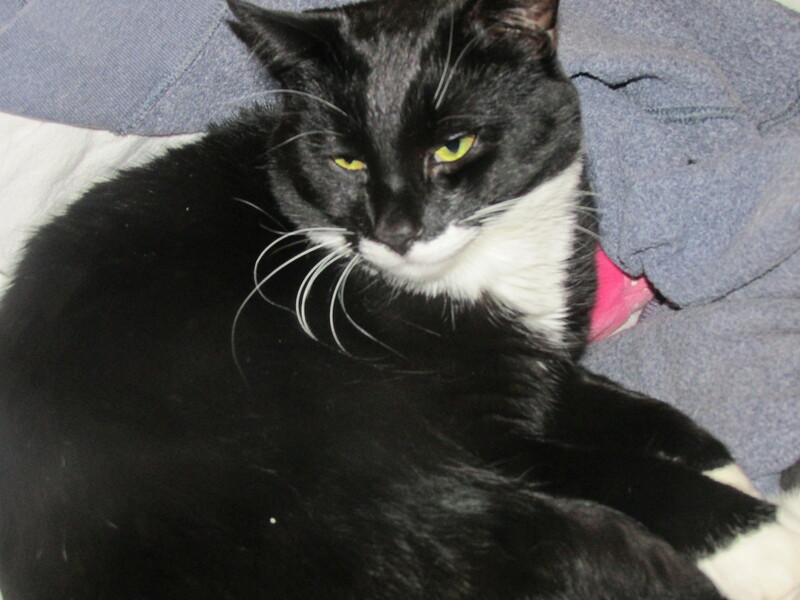 He wants to be loved, follows me around,a different cat then the one who came here In Sept. 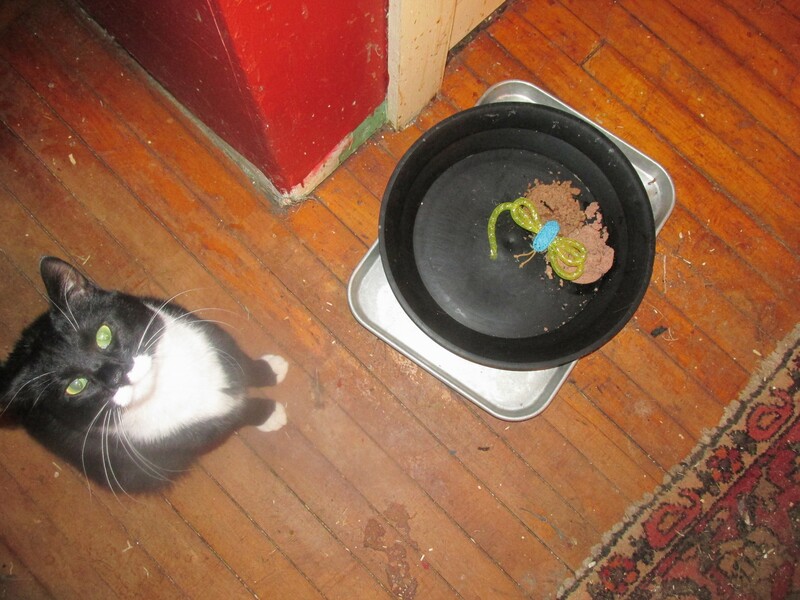 The picture of him with his food and a toy on top of the food is a dissatisfied cat. He like certain types of canned food and these weren’t among them. He will eat some of it then he gets a toy and deposits it on top, while trying to cover up the food with and invisible towel. 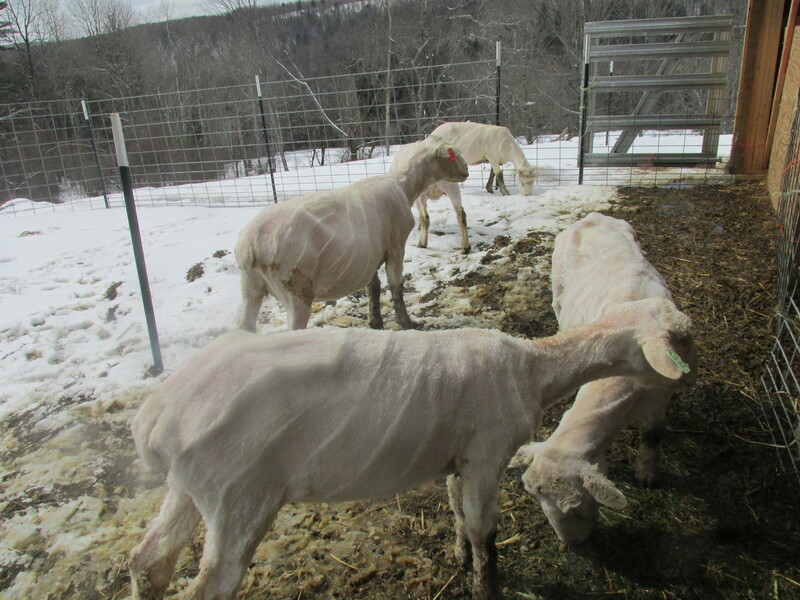 I will be setting up an appointment for shearing day soon. 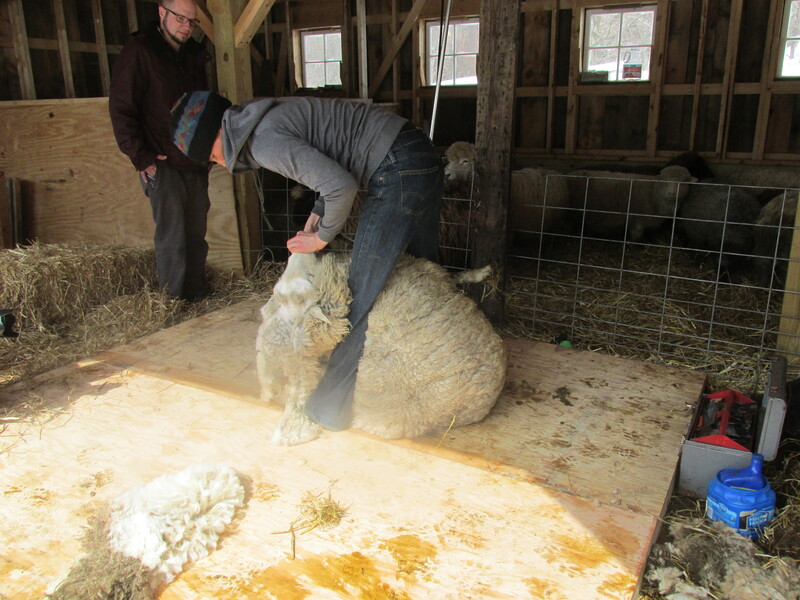 They will be glad to get this wool off. 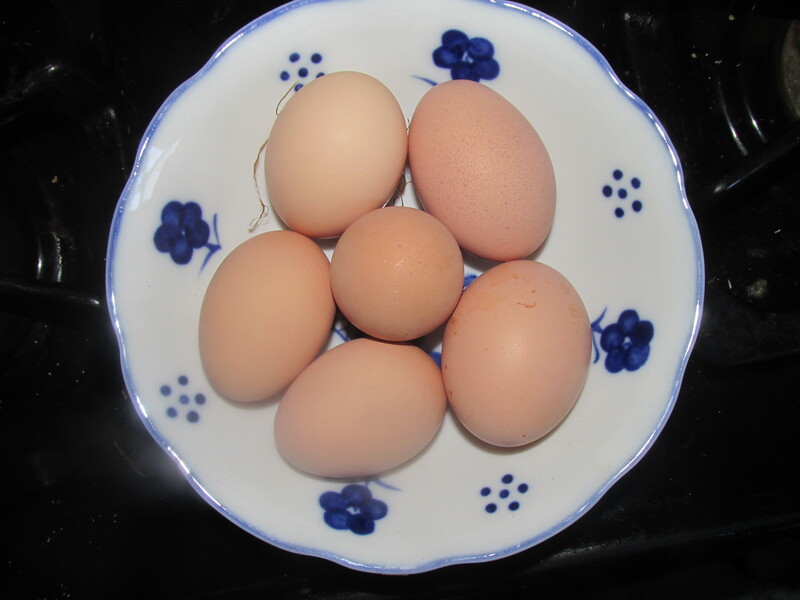 Many thanks for reading my blog today and I hope you have a lovely day. Another chilly morning with the temps going up this afternoon.. Rain coming tomorrow so I will have a busy day cleaning up things in the barn. 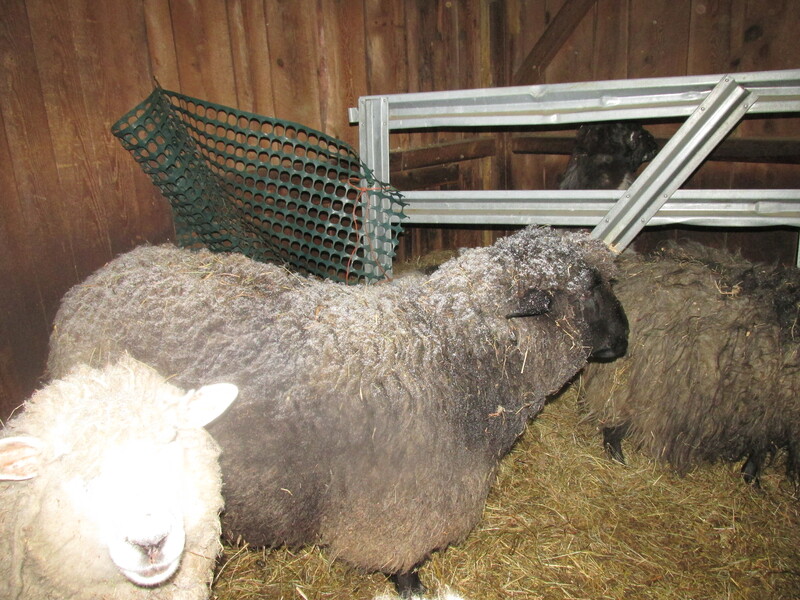 A little water has tricked into the sheep area I am hoping I can keep it at bay. Rain is coming in for tomorrow we will see what happens. 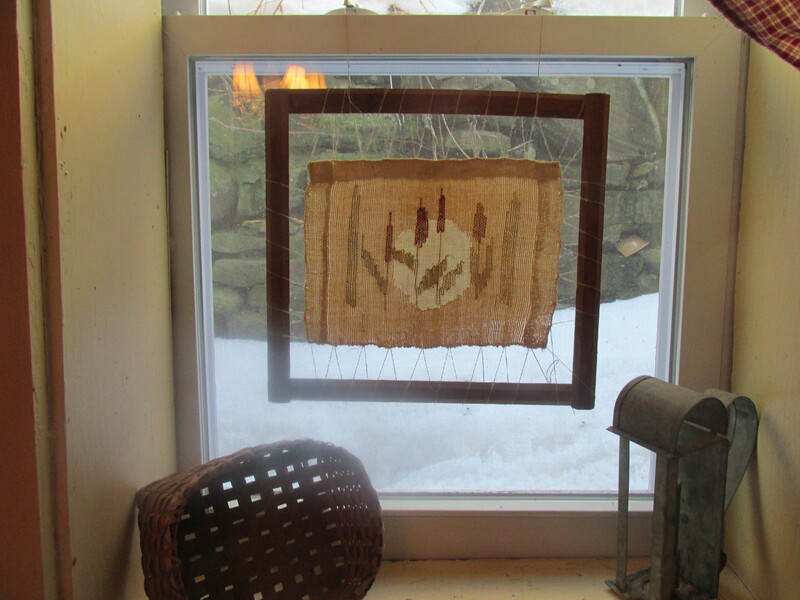 In the late 80’s I took the 4 year weaving course at Hill Institute in FLorence, Mass. I had never woven before and during the first class when the teacher was taking about warp and weft I wondered what she was talking about..The class was tough but I learned how to weave. Opportunities came along to take special classes and a Transparency class came up and I took it. This was another thing I didn’t know much about. I had just spent some time in Maine my Mother-in-Law had to have some serious heart surgery and at the time I was making baskets and wanted to make some out of cat tails. Everyday My Father-in-Law and I would drive up 95 to visit my Mother-in-Law and he would pull over on the side of the road and I would get out and pick cat tails. The whole back seat would be full of them, at night I would braid them. What came out of the cat tail adventure was a few wonderful baskets and this Transparency. 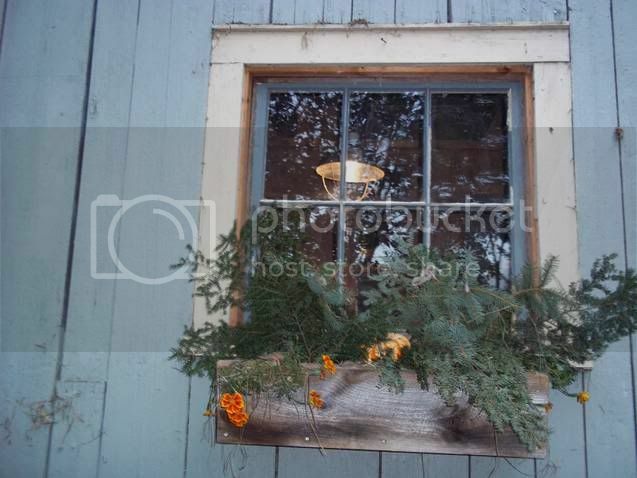 Its been hanging in this window since I moved in some 18 years ago. It is made of linen and has stood the test of time. But this past fall the threads which attached the picture to the frame had come apart. I finally got it fixed and back up. 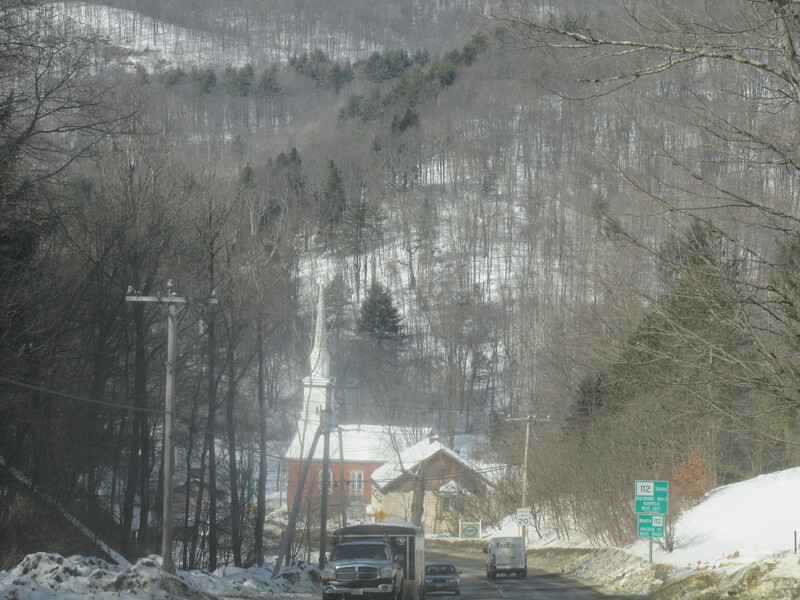 Each time I look at it reminds me of those days in Maine. In my teenage years I was a cheerleader. 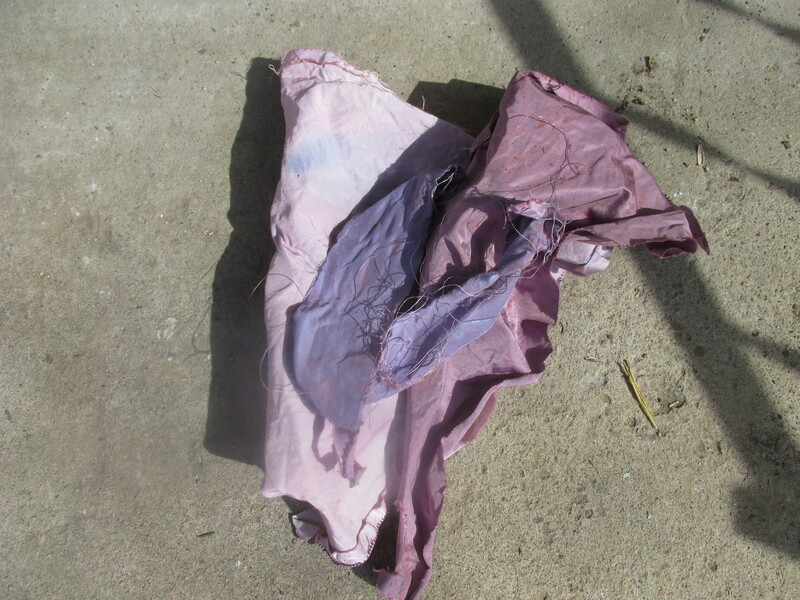 I have kept the skirt and decided that it needed to have a new life. 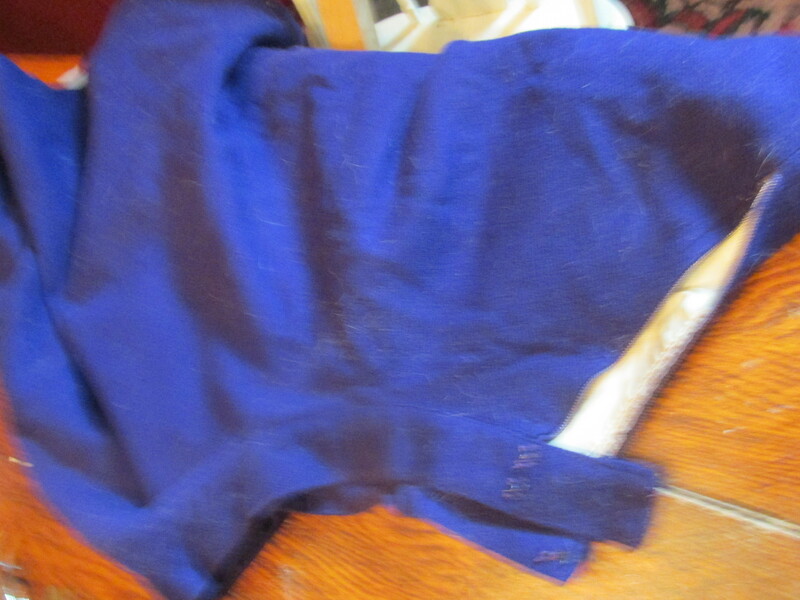 The lining is silk and I separated that and dyed some of that to use in my Blueberry Jar rug and the skirt itself is wool. 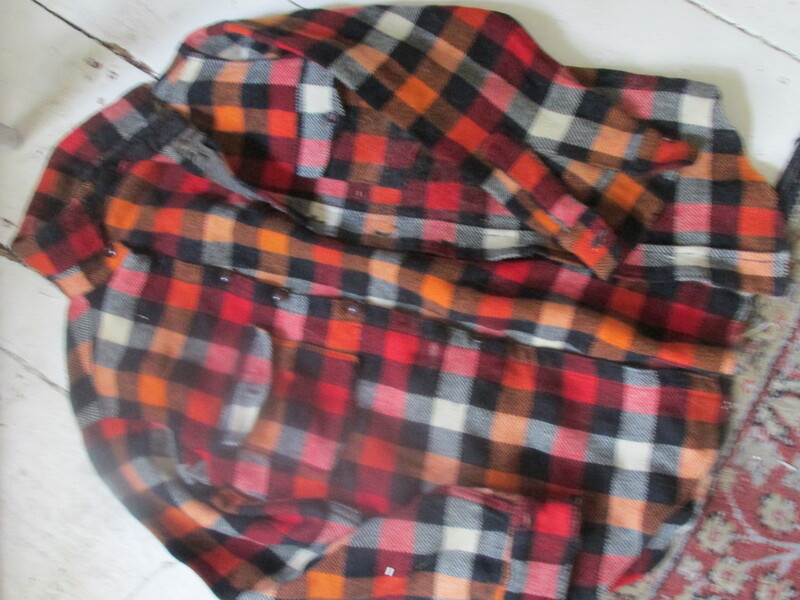 I also found this old wool work shirt that my Mother would wear in the fall. That will go into some rugs too. Eddie is such a delight. Every day I have him out, he love to watch what is going on outside the window. Sometimes it is my Son using his ATV to clear the driveway and other times it the birds bringing the seeds they get from the feeder up to the roof to eat them. Today he saw his first Blue Jay and he squealed. He will have so much fun outside this summer. IHelen is better but not cured. I will have to do more research. SHe still has some of that stuff in her crop and I work on her every day. She stopped eating the eggs and yogurt so she is back on regular food with some oatmeal and blueberries too. She follows me around when I am cleaning the cages and talks and talks.